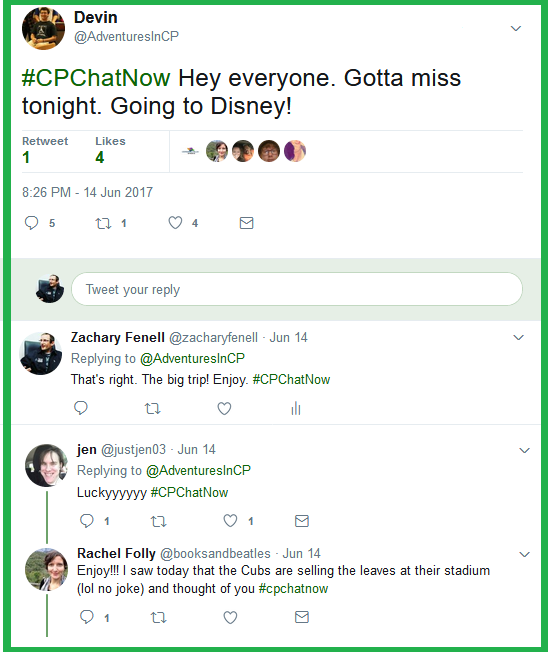 This week was an eventful week as always in #CPChatNow Land. Members discussed a wide range of things from getting new leg braces, to doing ballet as kids, to underrepresentation in the Cerebral Palsy community. This is Devin Axtman taking you along for this week’s ride. Now, we’ll end the recap on some good news. The person who attacked a man with CP at a gas station was arrested this week. However, Rachel pointed out that there is still work to do. 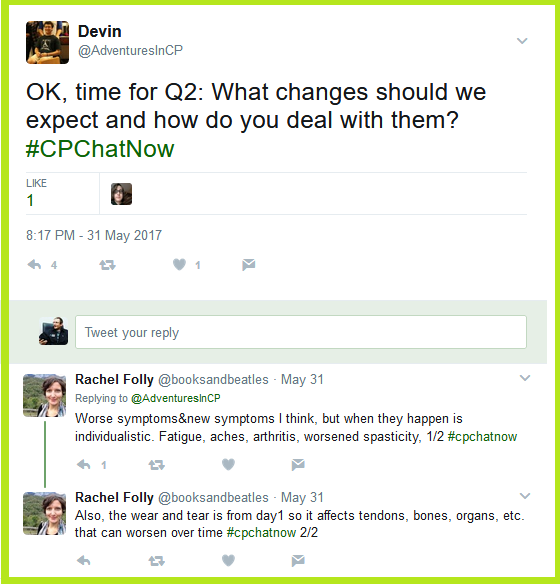 This brings us to our Extend-The-Conversation Question: What are some complications from CP that are underrepresented? Please share your answers in the comments. 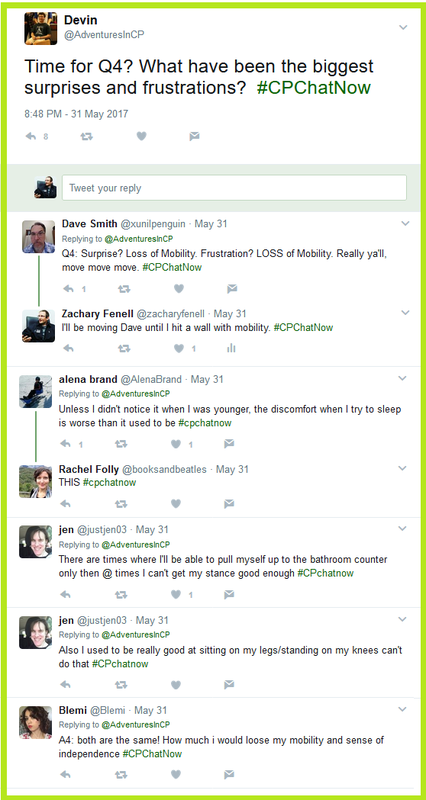 On Wednesday, May 31st, 2017 #CPChatNow presented a much anticipated focus chat about aging with cerebral palsy. 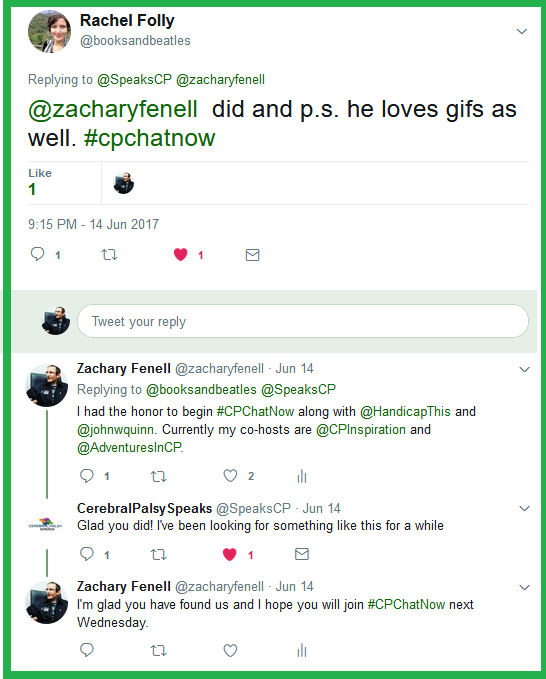 Interim co-host Devin Axtman and I (co-host Zachary Fenell) alternated asking the questions you in our community suggested. Questions which triggered vibrant conversation. Some highlights follow below. 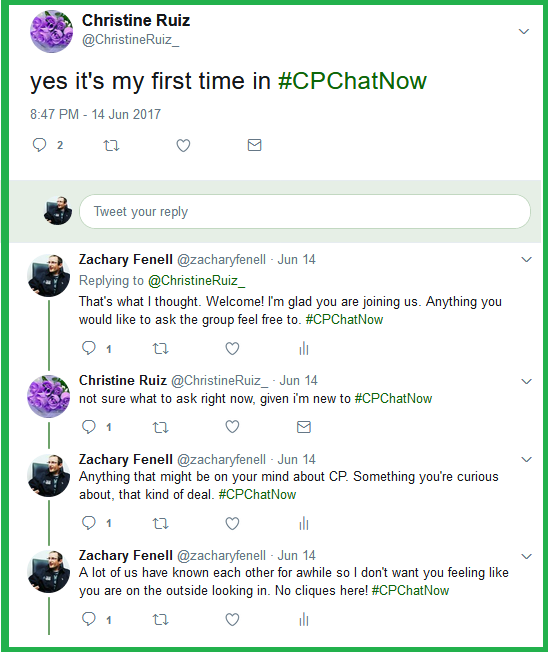 Now any credible chat on aging with cerebral palsy requires individuals willing to discuss their personal experiences. Therefore to start the Q & A we asked participants comfortable doing so to share their ages. Majority in the group fell between mid-20s and mid-30s. Although a few elder-statespeople ranging in age from 40 to 55 chimed in too. Meanwhile the youngest participant remains amidst her final year as a teenager. Once we established our participants’ credibility, we delved into our more substantial questions. 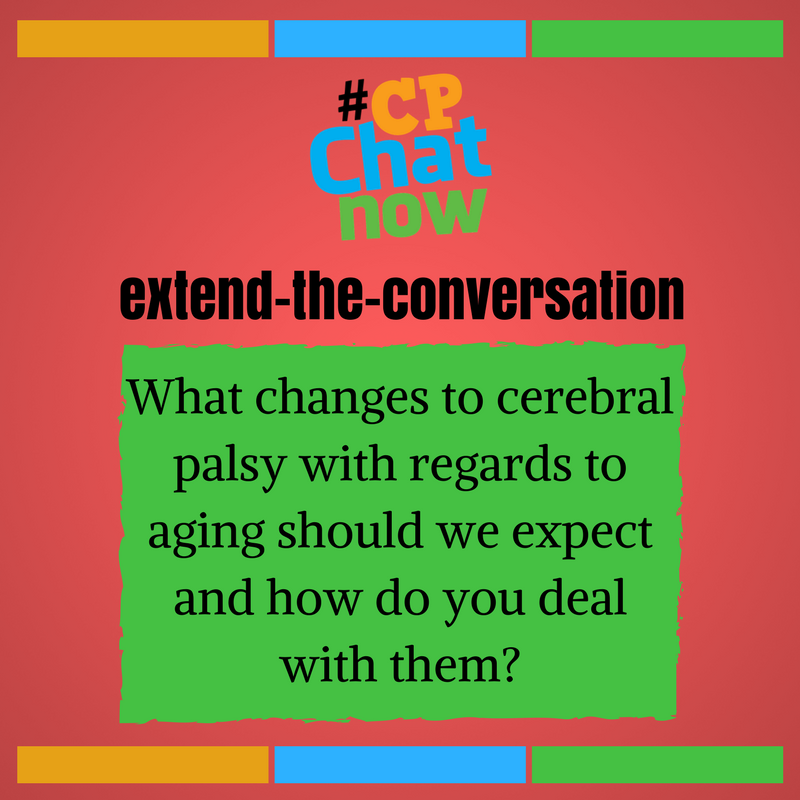 Our second question addressed what to expect aging with cerebral palsy and how to handle said expectations. Rachel expressed concerns related to every day wear and tear to the body, symptoms possibly worsening, and even new symptoms. 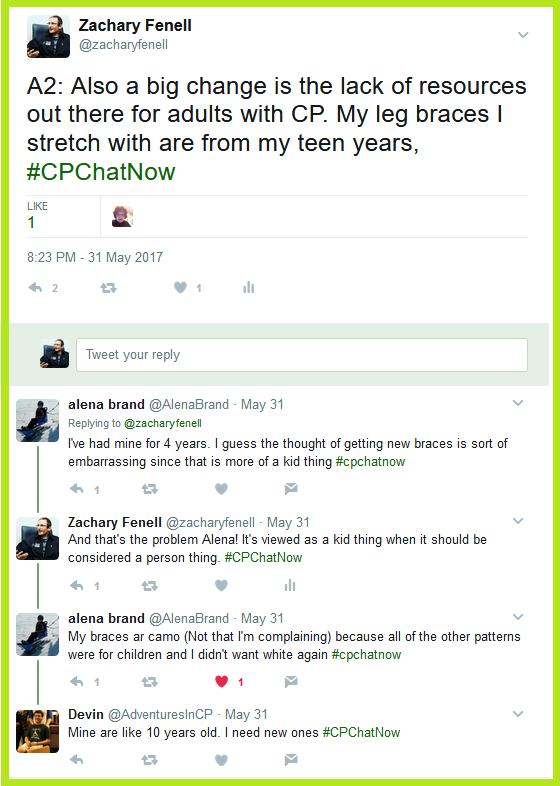 In my personal response to the question I mentioned lacking resources for adults with cerebral palsy. Turned out others also related to using older braces. Alena‘s reply particularly revealed an ill-fated perception viewing new orthotics as a “kid thing.” Concentrating more towards items we can control, Maysoon Zayid offered up hope. 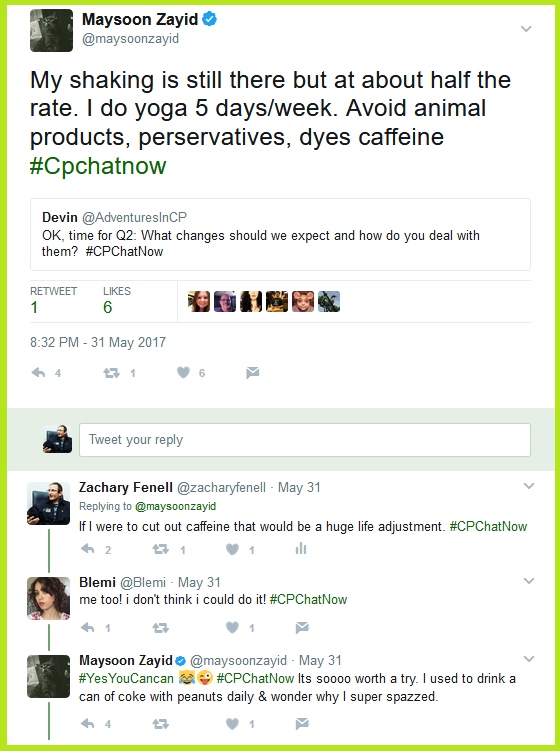 Through lifestyle changes like practicing yoga regularly and avoiding animal products, preservatives, dyes, and caffeine Maysoon explained that her CP symptoms lessened. What about you? 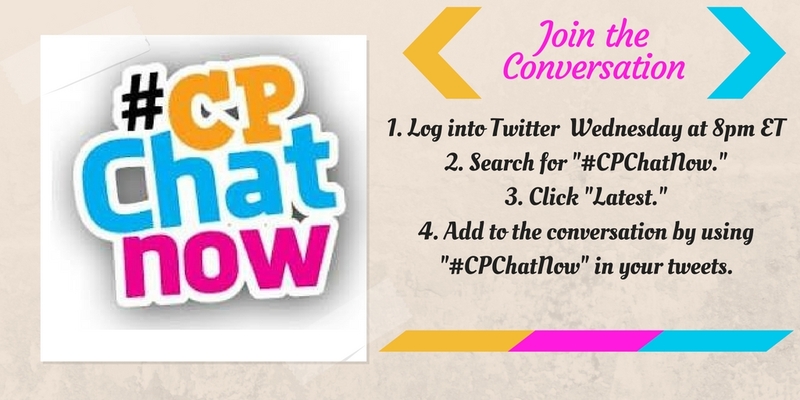 Your turn to add to the conversation! 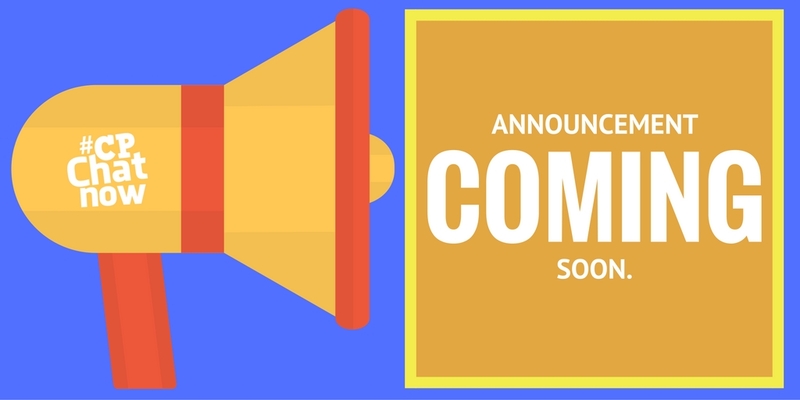 Answer for the week’s extend-the-conversation question, “What changes to cerebral palsy with regards to aging should we expect and how do you deal with them?” Leave your response in the “Comments” section. 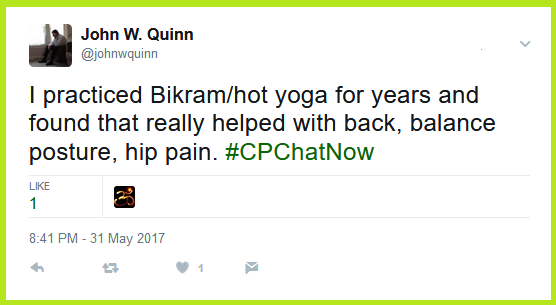 Maybe similar to Maysoon, you benefited thanks to yoga. 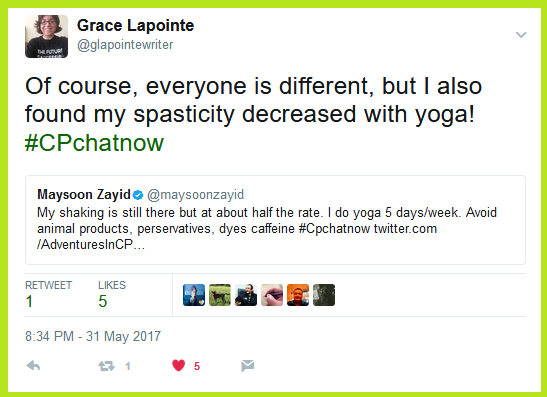 Actually, similar to Maysoon and others considering multiple people praised yoga during our “Aging with Cerebral Palsy” focus chat. 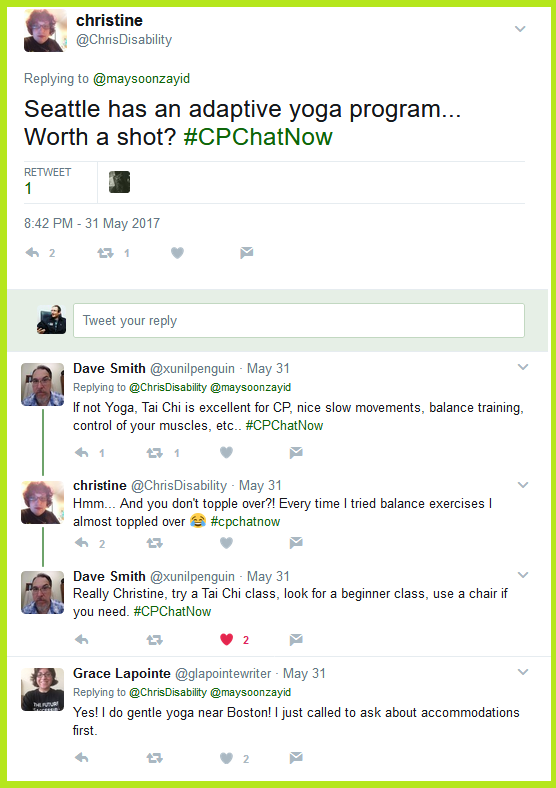 #CPChatNow newcomer Grace Lapointe and a fellow #CPChatNow founding father John W. Quinn alike endorsed practicing yoga. 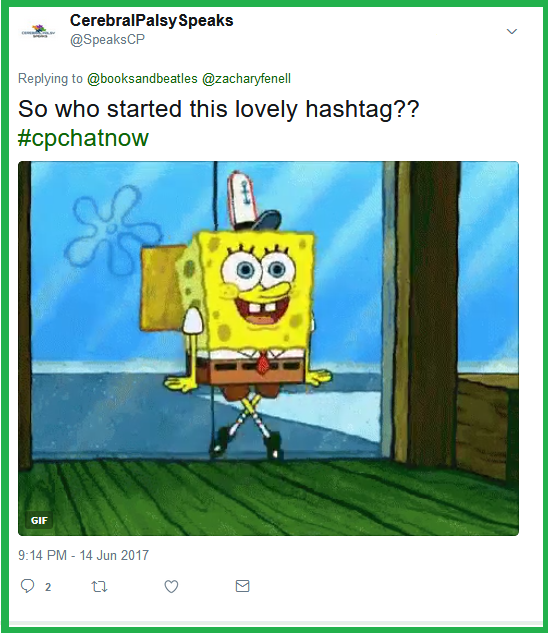 All the praise left another newcomer Christine seeking advice for getting started. Christine vocalized hesitation in getting started, nervous about toppling over. 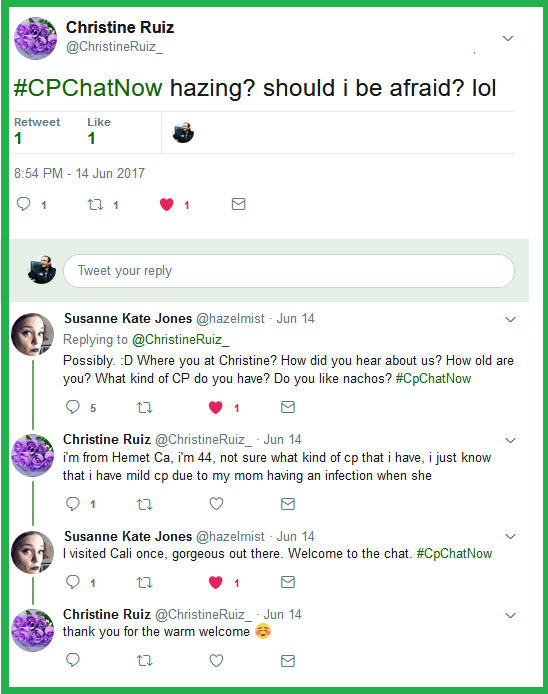 Participants rallied to encourage Christine. 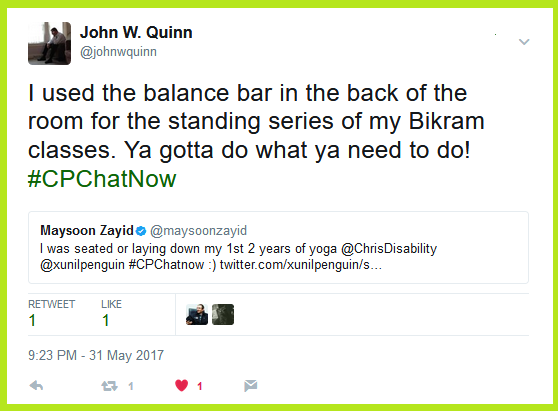 John and Maysoon both disclosed using assistance when first beginning yoga. Alongside the yoga chatter, our set questions for the evening continued. Question three asked about others’ experiences and tips to make life easier. 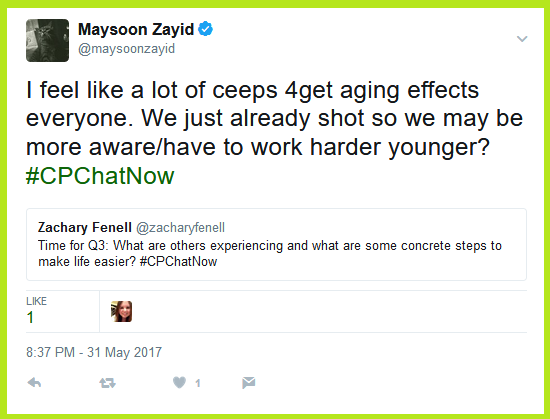 That led to Maysoon offering up an observation. 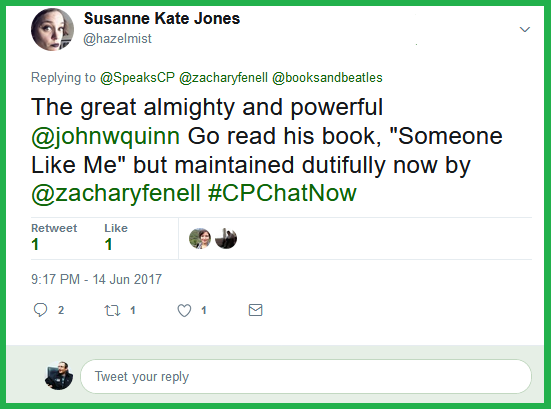 Similarly, John advised separating cerebral palsy from emerging health issues. 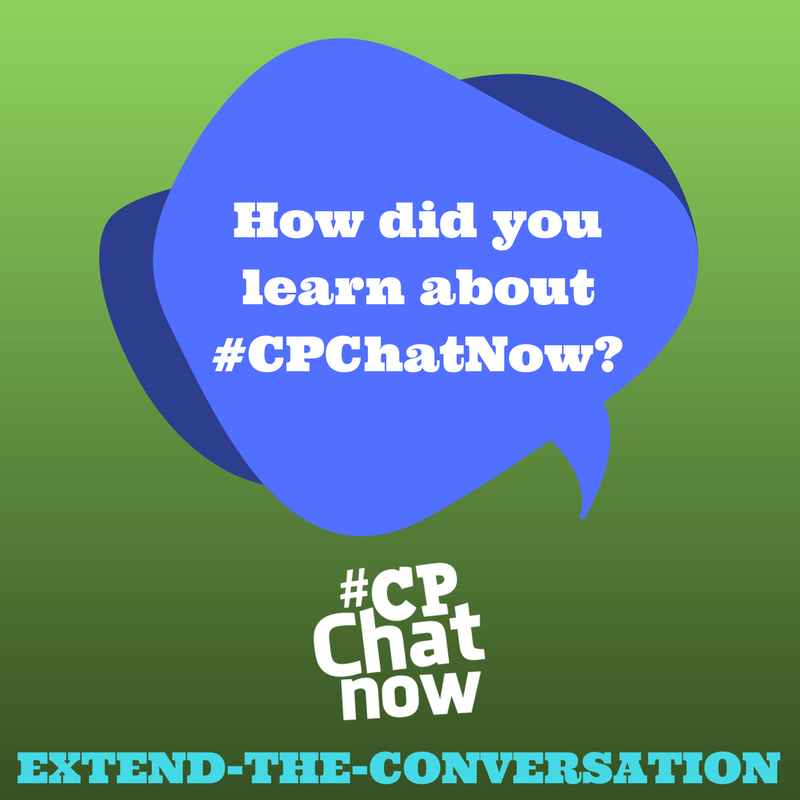 Next the conversation transitioned to the biggest surprise and frustration to accompany aging. A couple re-occurring themes appeared when community members named the biggest surprise and frustration accompanying aging. Those themes including dwindling mobility and discomfort when trying to sleep. 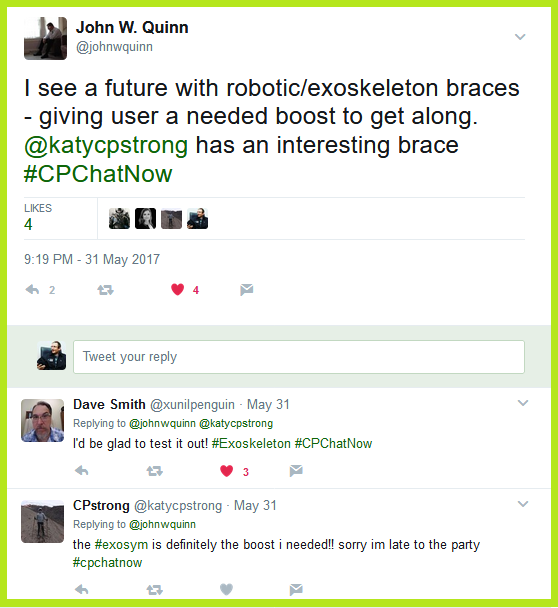 Ending the night optimistically, John recognized the potential boost ekoskeleton braces could offer the cerebral palsy community in the future. 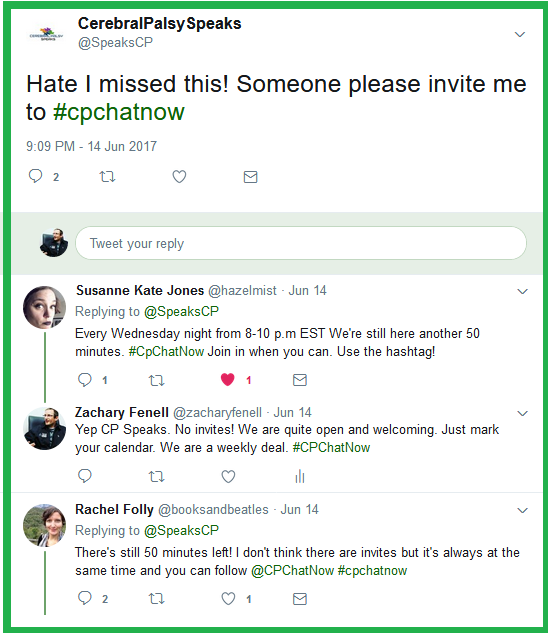 Hopefully our “Aging with Cerebral Palsy” focus chat recap will give you a boost in dealing with CP in your future. Remember you may keep the conversation going by answering the week’s extend-the-conversation question. Respond by commenting below. 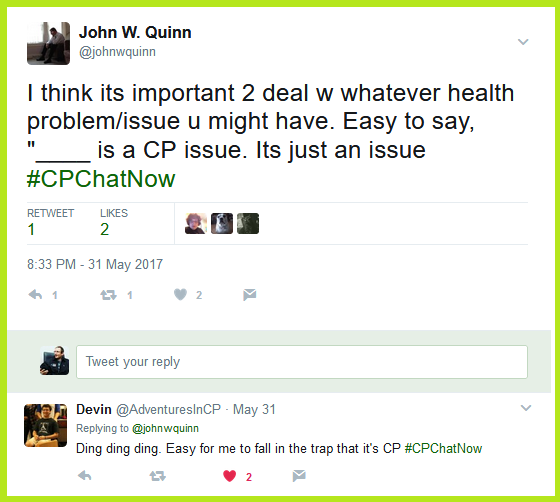 Expect Devin in the next few days with the recap for our June 7th Twitter chat. Until next time!